Well, this has been a long time coming, build I am ready to start post my build. First, a little about me. I am a 29 yr old engineer from Texas. I have been working on cars since I was 14. At 14 till I was 23 or so, I had to work on all my cars myself because I had very little money to have someone else work on them. Although it was a thought lesson to learn, the experience I have gain from it is priceless. I still work on my care myself, even though I could very well pay someone else to do it, because I enjoy it. I would never do it as a trade.. Although I have been asked several times, but refused as I just enjoy doing it as a hobby. I have been building kit cars since about 2001. I moved to a different part of Houston and met some people, The green lantern and Craig, that were into kit cars at the time. I then met other like IKR, which help me to look outside the box and really expand my knowledge and allowed me to get over the whole thought process of "if no one else has done it, then I can't do it". And for that I am truly thankful. My first kit was a Gen 1 IFG 355.I but it for $1000 and that’s about all its was worth. It was an up hill battle all the way but was a great place to start and to learn. I think I must have cut the top off 2 or 3 times and fiber glassed it back on. I ended up keeping the top and trying to fix all the problems with it. As most of you know...you can't. But again, it was a learning process and the information I learned from it was priceless. Here is a few picture of it. A few of you may remember it and a select few even made fun of it...which is ok and no big deal. After going so far with it, I traded it to a friend of mine for a testarossa kit. I do not remember where the kit came from but was a much better then the 355. It had all panel broken up as it should and was pretty close to the original, or a close as they got, anyways. This also taught me a lot about paying close attention to details like body gaps and panel alignment. I did not spend very much time on this kit as I started to go thought a divorce. I had to get rid of a lot of things and try to deal with real life. Some of you know how that is and it was no picnic. Here it’s a few pictures of it. I end up selling it to a guy in New Jersey and never heard back from him. I wonder if he ever finished it. After these 2 kits, It got me to really thinking about building a kit with all real panels. I knew about the Ad355 but did not really want another 355 ans thats car seems kinda plain to me. I wanted something more exotic with curves and a wow factor. I toyed with the idea of a Diablo but it seemed that "everyone" had one. I have always loved GM cars and while I thought about what I wanted to do, I had other toys. I had this trans am which I owned for 3.I got it in the 12's but found myself wanting more styling. Here is a picture of the TA which was 1 of 42 ever built. I deiced to finally sell it and start a 360 project. I started looking for used parts and talking to some people. I then starting to look around and ran across John's web page and knew that this is what I wanted. After calling him and talking to him, I sent the money. He was the only person that I found that was copying real parts in the entirety. I had no problem buying real parts as I truly believe that real parts makes all th different in the world. Case and part is Funny wheels car. He started off with a mirage kit and went to a Ad355, then started using real parts like wheels and challenge grill. He really inspired me and convinced me that it could be done. Once my money was down, I the started buying used Ferrari parts where I could and started building the chassis. I knew I wanted to use a supercharged 3.8 grand prix but did not know which trans I wanted to use. I decided to use the original 4t65e that came in it. I found a complete 99 GTP that I bought. This is key as apposed to buying a motor and trans from a junk yard. This allowed me to get the COMPLETE wiring harness and to use other things like the suspension, A/C, steering, and what knot. Here is some pictures of the GTP items mounted. 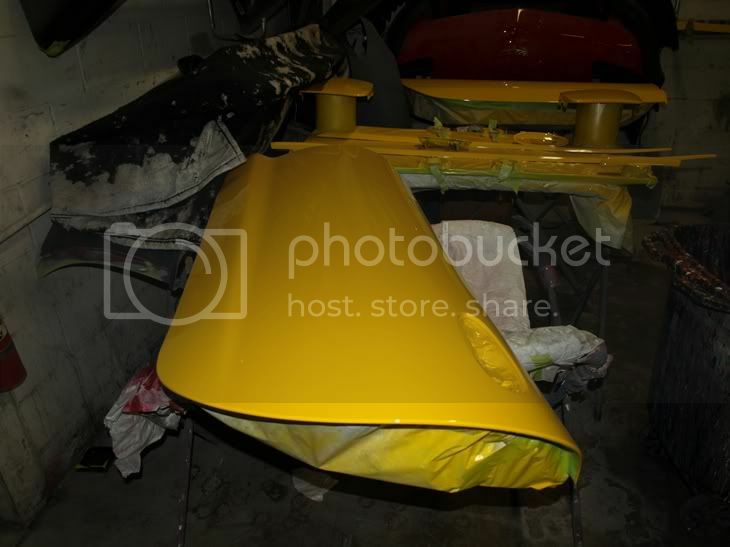 I have tons more pictures but just wanted to cover the basics to show you that there really is nothing left of the fiero besides the hull and vin number. This is so I can still register it as a fiero which I have no problem with. I then started working on the interior as I was starting to get all my original parts in. I have pretty much everything I need for the interior to make this thing look right. I cut the gas tank out and will be using the original gas tank from the GTP as it will fit either in the front of back, I still have not decided where I want to put it. The middle console has been reinforced and braced as well as the entire body before I cut the top off. This concept originally came from a design that IKR had a few years back. 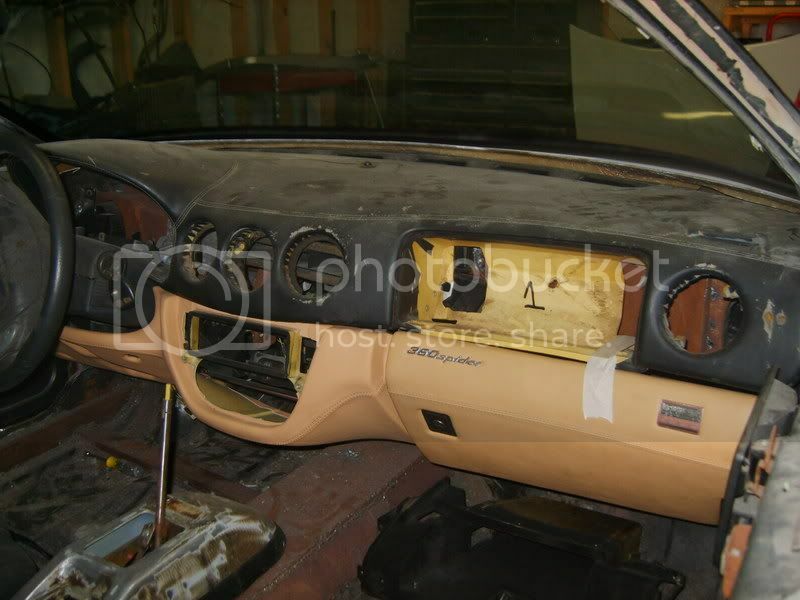 As far as making the original 360 dash fitting in a the fiero hull... piece of cake. It is like that dash was made for it. There is very little trimming to be done on the dash itself and in all I was very impressed on how well it fit. 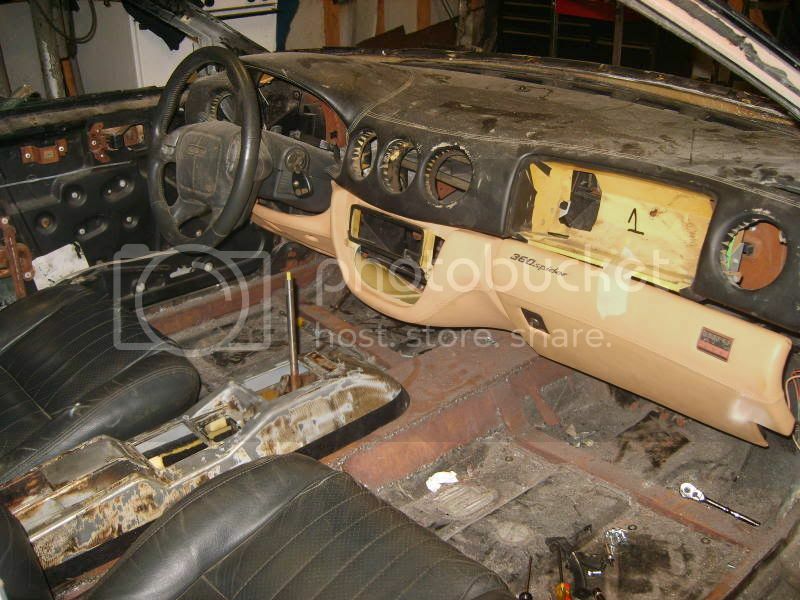 You do have to cut all of the fiero sub dash and commit to having a special windshield. Here is a few pictures, one of which you will see the windshield frame from John . I am using his extended windshield. And now for the moment you have all been waiting for. I finally went to pick up my body from John and after seeing everything he does in person, I am convinced that there is no one better at making pieces them him. He had an Extreme door there and I was amazed how much firmer his doors are then theirs. The door itself looks the same on the outside, but john fiberglass is much more thicker. Which may not mean much to some, but for someone who lives in 100 degree plus weather most of the year, its all the difference in the world. The other thing I liked about his parts it the fact that he molded the original mounting points. Which makes a lot of since , since I will be using original parts. Here is the original tail light panel and bumper mount sorely to Johns mounting points. I can't say enough bout John as a person and his parts. He has been extremely helpful in anything that I have needed. I would strongly advise anyone that wants a real looking car buy John's parts. I firmly believe that it’s the only true exact replica out there. Extreme and DNA are nice cars, but they were modified to fit a certain car and therefore are a few inches short or wide..ect.. Again, not to say they don't look good, but not 100% exact. With John's piece and buying a few other original parts, there is now way to tell any difference from the original car other than tapping on it and hearing that its fiberglass. I would also advise that this is not for someone on a very small budget. You can not complete this car, like I am doing for less than $20k or more...and that’s is just parts. But as most of you know, you will get what you pay for and at $6500 for the body you get from John is well worth the money spent. I honestly think that with materials going up in price, the price of the parts should be higher, but John is committed to making an affordable car that most could afford. I know that I have told him more than once but I think it is worth saying again, Thank you John. Now here is the picture of John parts. Please take note on how well these parts are made. I have taken some close ups of most of th parts to show you all the little details that he provides. In the one picture of the top cover, you can see he even molded the original Ferrari part codes. He also installs jam nuts in the original located so you can use real hinges. He has gone to great links to improve on his Ad355 and I believe that he has accomplished this. I would put my parts up against anyone in the world and I have no doubt that it will be evident who’s parts and car looks more real. Again, I am not putting down anyone because I think both DNA and extreme look great, buy John's pieces look that much better. !!!!! I like the donor too! isnt that like 300hp stock? Edit: Sorry I didnt read! I guess it's a Fiero with parts from the other. After I get my Murcie done, I'm definately doing this car. I cant wait to see more pics. How much did you spend for the engine and trans (I know you bought the whole car)? Wow, what a story. I feel as you do that John is as honest as they come and the parts he makes for his cars are unbelievable. I am positive you car will be top knotch. Awesome, I was very pleased with my AD355, and this looks great. Did you have to cut any front or rear frame off the Fiero?? 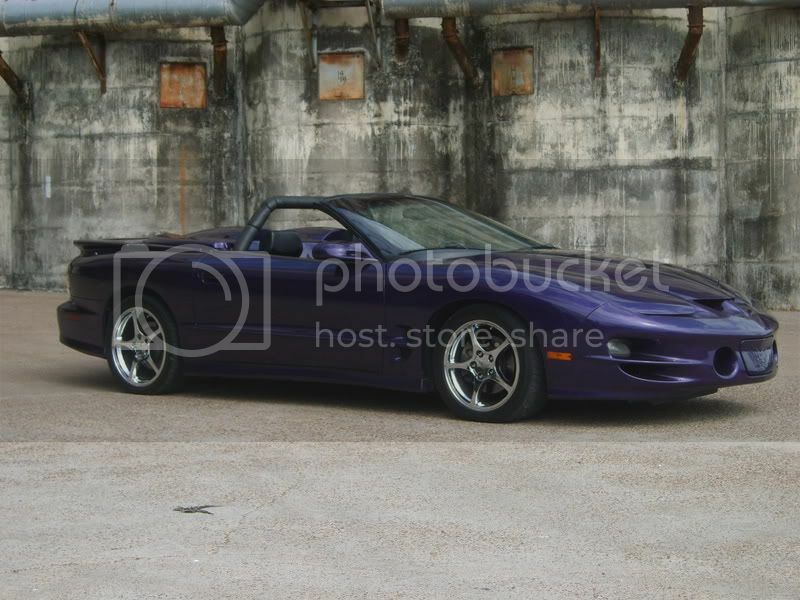 Does the Fiero has the correct wheelbase to match the F360?? The Fiero windshield frame looks taller and wider than the F360 (or maybe it's an optical illusion)....are you planning any mods on this area?? Best of luck on your project..
You do need to cut the front frame off as the headlights will hit if you don't. I have no use for either so I have already done this. The wheelbase does need to go back 9 inches which I have already done this. John has another way without cutting the frame in which you just move the k member and strut towers back. Either way if fine. The windshield I am using is the extended windshield that I got from John. These were custom made and have the curve of the Ferrari windshields at the bottom and fiero at the top. Although could be done, its is not advised to cut on the windshield tray as need a lot of support. Here is a picture of the windshield sitting on there. 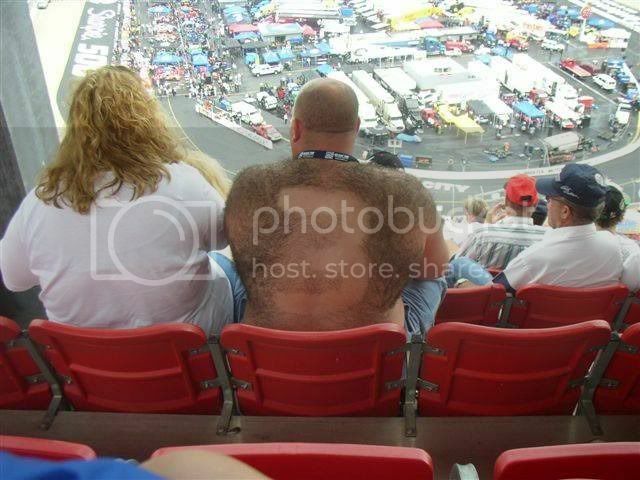 Please excuse the body, i had throw it up there to look at. That looks great! I can't wait to see it finished! Jets303 Official Lp640 BUILD Diary!